View More In Cameras & Camcorders. A video camera will be able to capture some timeless memories. Your young child wants to start filming some videos? Perhaps create their own rendition of Frozen? How about film themselves dancing to their favorite soundtrack? 1.Keep it inexpensive and durable! 4.A toy-type of video camera could be the perfect fit for a younger child. Taking into consideration the price, type and additional features you are looking for, then the AMKOV kids video camera may be the best one for your child. 1.Perfect for kids three to nine years old and DO NOT offer for kids under 3 years. 3.Would NOT take pictures if there is NO SD card in it. 4. TV Cable is NOT included in the package. 5.NOT compatible with mac OS. 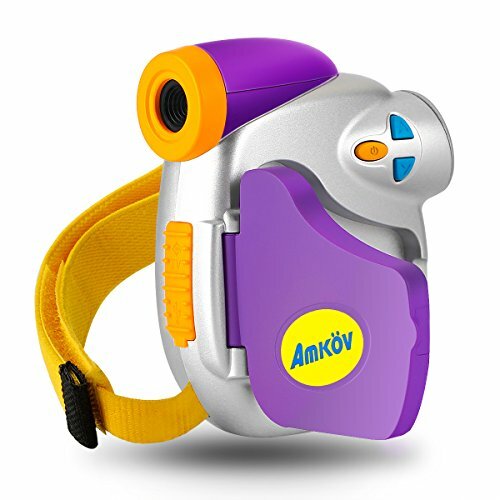 Durable - The AMKOV kids video camera comes with a hand strap like the traditional camcorder for a easy grip and some protection when recording videos, which is durable. Budget-Friendly - The AMKOV kids DV recorder is very budget-friendly for young children. With the kids camera of their own, they would stop requesting to use your expensive digital video cameras and no need to worry or constantly supervise their activities. Convenient - The AMKOV kids camcorder just need 3 AA batteries (not included in package) which is extremely convenient and it will automatic shut off without any operation to preserve battery life. Playback on 1.5 Inch Display - With the HD full-color TFT screen, you lovely can review the pictures and the videos on the toy camera. If you have any questions about this product by AMKOV, contact us by completing and submitting the form below. If you are looking for a specif part number, please include it with your message.